What Is the Profit Margin of a Storage Facility? Self-storage facilities grew in popularity in 1960s America, with the first unit appearing on the scene in Texas. Their success has been directly in proportion to the growth of consumerism. As consumers' buying power increased, people needed a place to store all the stuff that wouldn’t fit in their homes. Forbes lists the self-storage profit margin as 11 percent, making this one of America's most profitable small businesses. Profit margins are around 11 percent. They don't require many amenities that reduce profit margins, such as landscaping, employees and maintenance. There are revenue strategies such as late fees, climate control, and after hours access to increase earnings. In addition to providing storage space, the units are becoming increasingly upscale. They answer a need put forth by today’s homeowner associations which may not allow RVs or boats to be parked in driveways or lawn furniture to be left out all year. Some self-storage units provide the affluent homeowner with space for a wine cellar or climate-controlled art storage. In general, they provide space for those possessions people can’t live with and also can’t live without. High-end storage facilities are popping up to provide an experience similar to being at home, with kitchens, basketball courts and even spaces to entertain. Storage facilities are typically very large, which means that the owners may pay a higher percentage of land taxes. The amenities that typically reduce profit margins in other business enterprises are greatly reduced in a storage facility. Landscaping may be minimal. Demand for lighting within the units is limited to whenever the renter is on-site. Few employees are needed to ensure smooth operations. Expenses to operate a storage facility primarily include utilities, security, maintenance, cleaning and office staff. Normal operating expenses for a self-storage facility generally range from $2.75 to $3.25 per gross square foot of the development. 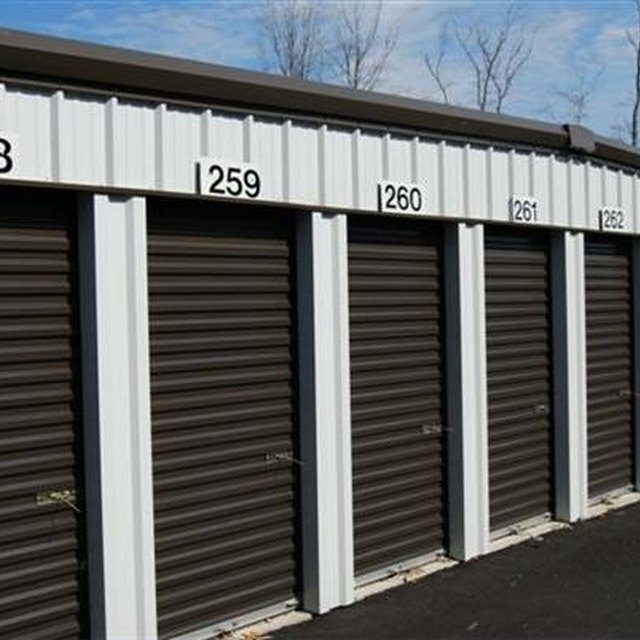 A storage facility typically offers units in different sizes, with rents based on the square footage of the unit. They may include basic units and climate-controlled units. Rental fees can vary quite a bit depending on location and amenities offered. Average rents are anywhere from $6.50 to $12 per square foot, and climate-controlled units command a higher rent than basic units. Storage units may cater to specific needs, such as for boats, RVs or wine. Catering to a high-end need usually commands a higher rental rate. Some storage units offer premium services like boxes and packing materials, and even packing assistance. Other income comes from late-payment fees, additional charges to offer customers increased security, truck-rental commissions or after-hours access. These revenue strategies can amount to an additional income of around 5 percent. Income can be long-term because people often store things at a facility that they no longer have room for anywhere else. Obviously, the more renters a storage facility has, the more income it takes in, so profit depends on vacancy rate. The goal of any self-storage facility is a low vacancy rate. Investing in more climate controlled units, which command a higher rental price per square foot. Offering higher-end services such as wine storage or art storage, with units geared specifically to those needs. Increasing occupancy rates from the break-even points. Since a storage facility typically has lower overhead and operating costs than other businesses, it also enjoys a lower break-even income. This means that the return on investment can be high, and a storage unit facility often enjoys a high profit margin when compared with other business ventures. According to research by self-storage experts at Parham Group, a 29.6 percent return on investment is a typical self-storage profit margin.